When I woke up Thursday morning, I was gearing up for another awesome sunshiney beautiful gorgeous day, when I realized that my room had darted back to its February temperature. Fearing the worst, I looked outside and it was all cloudy and not beautiful gorgeous either. Womp womp. So I ended up spending the better half of the morning working on job applications watching a movie called Brassed Off. Funny story about this movie: I had never heard of it before: I was doing some research on a certain song called Tubthumping by Chumbawumba (god, I feel old). I don't know if any of you have ever heard the intro to the song before, but it starts off with an audio clip spoken by Pete Postlethwaite saying "The truth is I thought it mattered. I thought that music mattered. But does it, bullocks. Not compared to our people, matter." (It makes more sense with his Yorkshire accent). So I, resident film nerd, took it upon myself to perform the arduous task of googling said audio clip in order to find out its origin. 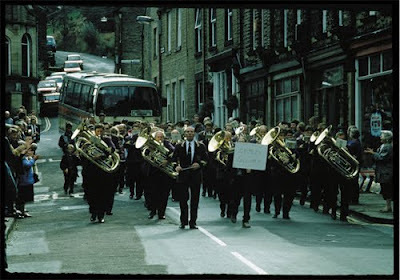 Then I looked up Brassed Off on Netflix, added it to my Netflix, and promptly forgot all about it. Until I found it as a VHS in Liberty Thrift. Yes, my VHS haters. For the price of $1.00 I now own Brassed Off. One funny thing about this movie, though, as it is with most obscure movies, is that the movie's cover did not really advertise the true inner workings of the plot (I know. I was just as shocked as you probably are.). In fact, the movie's cover seemed to suggest that this movie is a romanic comedy, which is pretty much the exact opposite of what it actually is. I mean, the tagline of the movie is "Together Again...And Turning the Town Upside Down!" Ummm...not really, dude. Contrary to what this cover may have you thinking, this is not the British She's All That. The movie's plot is actually set on the backdrop of a mining town and what happens when its colliery (that's British for "mine"), the villagers' main source of income, is put under a possible shut-down as a result of the "Tory Party" (doesn't that just sound too British?) trying to modernize England and phase out coal mining or something. But that's just the backdrop. The problems of the villagers to come up with money, the emotional strain of being on strike, and all kinds of other problems are only heightened when they're put in contrast with the small problems and awesome sound of the village's colliery brass band. The band, which has been running for 100 years, is led by sweet but narrow-minded Danny (Pete Postlethwaite), who refuses to take in the situation going on around him. Despite his son, Phil's (Stephen Tompkinson) various troubles with money and managing his family, Danny seems to focus whole-heartedly on the band. One day, the band is approached by a girl named Gloria (Tara Fitzgerald), who was born in Grimley and wants to practice with the band while she's there "on holiday" (highly suspect...). The band (which is all dudes) welcomes her incredible flugle skills and she is asked to go through the band's next competition playing with them. Entranced by Gloria is Andy (Ewan McGregor, fresh off of Trainspotting), who has had a crush on her since they were little. The ensuing tangle of a storyline then follows Danny's declining health as a result of all his mining years as he refuses to see what is around him; Phil coming to terms with the reality of his familial and financial situation; and Andy and Gloria's relationship after everyone finds out she is a surveyor for the very company that is trying to shut down the mine. It's actually very well put together. Set up as a political commentary film about the underdog of Yorkshire amidst the bigger dogs like Wales and London (I'm going off of Danny's speech at the end), the film actually manages to successfully get their audience rooting for the people of Grimley and, perhaps less importantly, their brass band. Speaking of their brass band, I've got to say (even though it's fairly obvious that none of the actors bothered really learning their instruments. Yes I'm talking to you, Tara Fitzgerald) the soundtrack is pretty great. I don't know about you, but when I hear "brass band", the only songs that come to mind are John Philip Sousa marches. Despite this, the film managed to pull off some pretty gorgeous songs that I had never heard before, or at least never played by a brass band (look up their clips of Danny Boy and Rodrigo's Concierto de Aranjuez. Dayum.). Well done on the soundtrack, kids. In terms of the film again, though, I will warn you there is quite a lot about this film that ends up being dark (which is really why I couldn't understand them calling it a romantic comedy?) and even though it ends on a high note, there is still a good portion of it that leaves you kind of crestfallen. The miners are so let down by everyone around them and there is such a large number of people that end up being screwed over by the government that it makes you think. Probably what they were going for. I will say that the only point that they didn't have me sold on, in terms of shutting down mines being a bad thing, was the health risks. 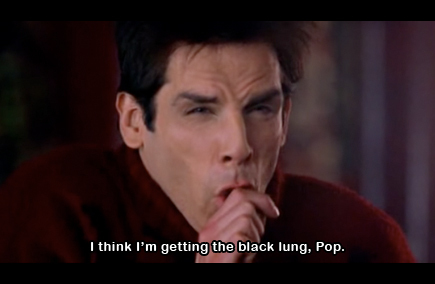 I was a little surprised that they put Danny having the black lung when their agenda was so clearly to persuade people that mining is a lucrative and profitable industry. Sorry folks. Not buyin' it. Pretty good for a political movie. And just funny enough to keep you going.